[15:39] <JZA> why you want this mini computer? Mediacenter? Tor node? [15:39] <JZA> whitesn: ah ok.
[15:40] <JZA> then you wont be dissapointed. I mean, there are many projects you can do with Rpi that would work great. [15:40] <jeffreylevesque> anyone familiar with ZigBee? [15:40] <JZA> is usually when you already want to do something that you did with a real PC, that you find yourself restricted. [15:41] <JZA> well yeah, is fine, I mean you will have bash or openbox or something like that. [15:43] <JZA> since the keyboard/wifi fills your slots. [15:43] <whitesn> just ssh access i guess? [15:43] <JZA> yeah, thats fine. [15:44] <JZA> I am using it as a media center, so I want my controller on the TV. [15:45] <JZA> anyone tried google hangout on the Rpi? I know there is a webcam for the py to do videoconferencing. [15:45] <JZA> But dont know if Rpi can handle GH. I have a chromebook and does great. [16:05] <stillshi> Hello I just got a raspberry B+ model and get Scratch installed. the sound worked once that never afterwards. any idea to help the trouble shooting? [16:09] <stillshi> i googled and and in the latest version this line is already changed to this: VMOPTIONS="$VMOPTIONS -vm-sound-alsa"
[16:28] <jeffreylevesque> anyone here have experience with XBee? [17:53] <J_Darnley> Can someone give me some pointers on diagnosing why a new 3TB hdd only shows 746GiB on my Rasbian install? My initial searches suggest some problem between 32- and 48-bit addressing. [17:56] <jeffreylevesque> maybe, it takes a few seconds to process? [19:05] <droid909> so i just install rasbian and LIRC, ... what about the wiring? [19:31] <droid909> methuzla: so then i just substitue leds rigth? [19:43] <J_Darnley> Can someone help me troubleshoot connecting a 3TB hard disk to my Raspberry Pi? Some tools correctly see all 3000G on the drive but not others. [19:50] <J_Darnley> Should I head there and ask again? [19:56] <droid909> methuzla: thanks, do you think the image you sent me, is this where the RPI has ad SD card slot or upside down? [19:59] <methuzla> not sure i follow you. pins are labeled in the image. [20:01] <J_Darnley> CoJaBo: I have seen that and I should have said that only 746G are seen by most tools. [20:01] <CoJaBo> J_Darnley: That's.. odd; usually they just either fail or stop at 2TB, but eratic behaviour might be possible. [20:02] <J_Darnley> Yes. Most things I have read are outdated and about a Windows PC. [20:02] <CoJaBo> If the tools don't support GPT, or the disk somehow isn't GPT-partitioned, Weird Things can happen..
[20:04] <J_Darnley> On my desktop I have used gdisk to create the GPT label and mkfs.ext4 to create the filesystem. Both of which appeared to work. [20:04] <gordonDrogon> gdisk is the utility you might want to use to create a GPT partition on it. [20:04] <J_Darnley> ... what did I just say? [20:05] <CoJaBo> What tools are failing then exactly? maybe there's a bug in the ARM port or something..
[20:09] <J_Darnley> What do you mean by "check"? [21:51] <divx118> droid909 I suppose you want to control some devices with your ir leds, I suggest to follow http://alexba.in/blog/2013/01/06/setting-up-lirc-on-the-raspberrypi/ Works perfect for me. [21:52] <droid909> divx118: do i need something besides resistors RPI and ir leds? 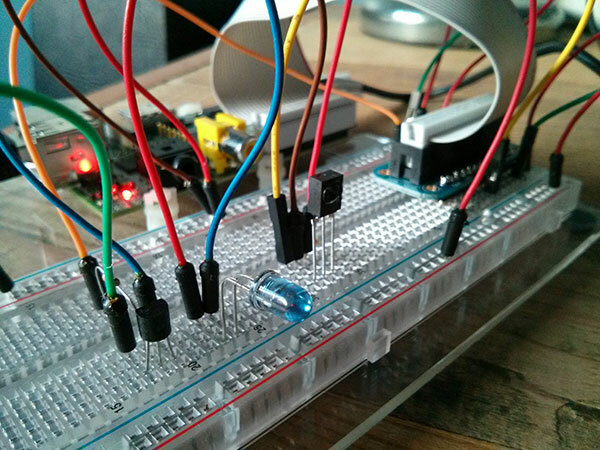 [21:52] <divx118> ir led is best driven by a transistor instead of straight from the gpio pins. [21:55] <divx118> It can, but you won't have much range. Just be sure you don't draw too much power from the pins or you will damage them. [21:58] <droid909> divx118: is it the same? [21:59] <divx118> Yep that will do. I use myself a bc547. [22:06] <divx118> droid909 Just follow the schematic. It is real easy. What don't you understand from it? [22:19] <droid909> Bilby: i can use any ground pin? [22:19] <Bilby> any ground point, you don't have to use pins on the pi. [22:20] <droid909> Bilby: all ground can be on one wire and go to one rpi ground pin? [22:25] <divx118> droid909 I use the 5V and ground from the pi to drive the ir leds. [22:27] <droid909> divx118: he said he uses 'yamaha' config he created, but there is not a word about this config, where do you set a name ? [22:28] <divx118> droid909 You can do that in the config file. [22:30] <divx118> Yep change the name "name /home/pi/lircd.conf" to "name WhatEverYouWant"
[22:32] <divx118> I think you switched the emiter and collector. He uses a p2n2222 and you have a 2n2222 pinout is different. [22:46] <droid909> divx118: can you make a photo from top of your wirings? [22:53] <droid909> divx118: and why he has 2 leds in the schematic? [22:53] <divx118> You will have some more range. 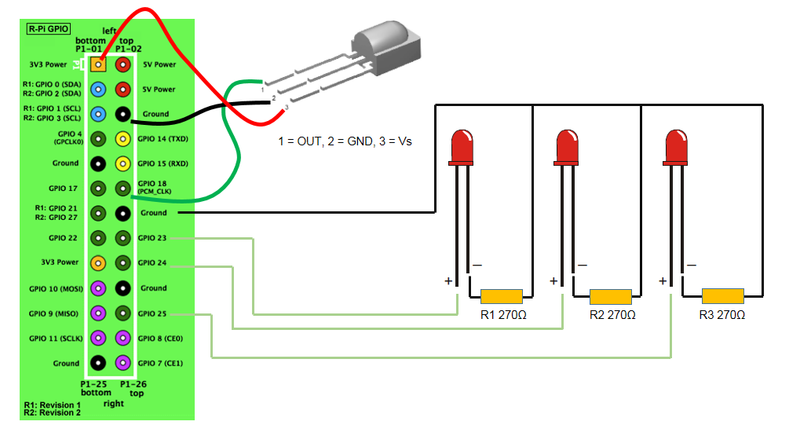 [22:54] <divx118> If you don't use two leds you will need an extra resistor in series with the one ir led to control the current. [22:54] <droid909> divx118: could this be a reason of my led not working? [22:56] <divx118> I think you did have your transistor the wrong way around. Also check that the ir led is connected in the right direction. [23:05] <DoctorD90> hello guys. Some days ago, i have started my rpi, with raspbian. I have plugged in my usb stick, and i cant create anything. No file/folder creation/editing allowed. What can be wrong? [23:07] <DoctorD90> Encrypt, ehm..sorry me, what do you mean? [23:07] <Encrypt> DoctorD90, I assume the USB key is formatted with FAT, right? [23:08] <DoctorD90> how can i fix this issue? [23:09] <jjido> all right, so I have my RPi running X and I am connected via SSH. Now can I take control of the lil' one's keyboard and mouse? [23:10] <jjido> DoctorD90: from my machine or from the pi? [23:13] <jjido> I see several VNC packages, which is it? [23:15] <jjido> mmh I don't have permission to run apt-get. [23:49] <jjido> I did not manage to get VNC working. The client gets kicked out immediately, no password asked. [23:50] <methuzla> what vnc server did you install? [23:52] <Froolap> it's the firewall or selinux. [23:53] <jjido> Raspbian has a firewall on by default? [23:55] <methuzla> did you actually start the server after installing it? [23:59] <jjido> methuzla: yeah. But the display number looks like it was missing, and now I managed to connect!